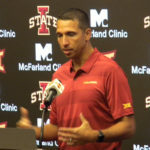 The Iowa State Cyclones arrived in San Antonio on Sunday as preparations continue for Friday’s Alamo Bowl against 13th ranked Washington State. The 24th ranked Cyclones are expected to bring a large fan following with them. Campbell wants the players to enjoy the bowl activities while remaining focused on the game. Iowa State is 8-4 and with a victory would equal a school record for wins in a season.